Looking for something to bring to a pot luck or even to your next picnic, this Asian Crunchy Slaw is perfect? This salad is perfect for when you want to bring a type of cole slaw that is a little bit different. This recipe isn’t difficult to put together, so if you haven’t a had a lot of time in the kitchen, this Asian Crunchy Slaw is the one for you. This Asian Crunchy Slaw slaw has Ramen noodles, and slivered almonds that really help make this nice and crunchy. You can make this salad ahead of time, and serve it up later. When you need a large salad that as an Asian flair, this is the salad recipe for you. Get your largest bowl, you will need it, this salad makes a large amount of salad. Slice Napa cabbage into 1/4 inch slices, you may want to roughly chop the cabbage again so the pieces aren't too large. Slice green onion tops and add to bowl, reserve the white parts of the onions for another recipe. Melt butter in a large saucepan, add Ramen noodles to saucepan breaking them as you put them into the saucepan. The most difficult part of this recipe is browning the noodles, and not burning them. It doesn't take long before the noodles are burnt, it seems to happen only a second or two after they are toasted, watch them carefully. Add toasted Ramen noodles to the salad. 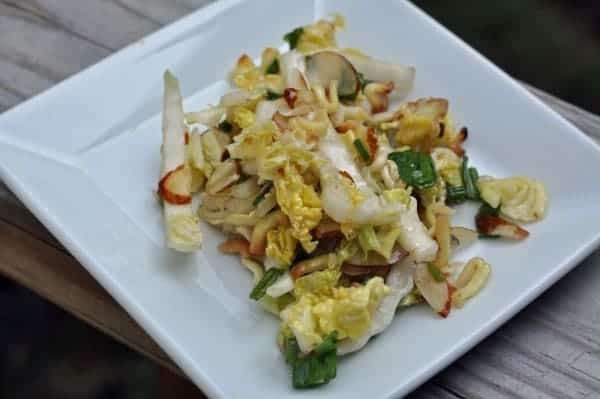 Add slivered almonds to salad, use your hands and toss the cabbage, green onions, toasted ramen noodles, and almond slivers well. To make the dressing, use a medium-sized bowl, or a shake bottle if you have it, add sugar, vinegar, dry ginger, dry mustard powder, Worcestershire sauce, and vegetable oil. Whisk thoroughly, it may seem the sugar won't dissolve, it will. If you wanted, I bet you could substitute the sugar with either equal or Splenda. Once the sugar as completely dissolved pour over slaw and mix well. I have taken Asian Crunchy Slaw to a couple of potlucks recently with hopes that I would have a little extra to take home, and this didn't happen. So I think this recipe is a real winner. What recipes do you bring to your potlucks? Fantastic recipe! It helps to smash the noodles while in the package. I added 2 tbs of soy sauce to the dressing. So good!!! My aunt made this asian slaw for my bridal shower, and it was a HUGE hit! Everyone took seconds and thirds, and soon the gigantic bowl she had prepared was gone! Them ramen noodles are amazing and the dressing is to fantastic! I would recommend this salad for any event! Looks incredible, I’m going to make me one now! Thank’s! That looks good enough that I may even be able to get my hubby to give it a try. We have something similar here in Thailand with the ramen noodles (they call them ‘mama’ noodles here (a Thai brand name). Love your recipe though. Sounds easy to do. I have made this salad before and it is awesome. The last time I made it, I substituted a head of cabbage fort the pre shredded slaw. Still as awesome. Kristine I have added sliced almonds to the noodle and butter mixture. I make one very similar to this one, but I do not cook the ramen at all. The dressing softens them just a tad. It is really delicious. I think that sauteing the noodles in butter adds a little on the flavor side, but I also believe it helps to seal the noodles so they don’t soften as quickly as they would otherwise.